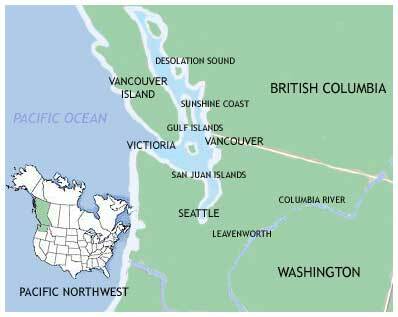 The Pacific Northwest extends from the ocean to the continental divide and includes all of Washington, most of Oregon, Idaho and British Columbia, and adjoining parts of Alaska, Yukon Territory and California. The region is dominated by several towering lush mountainous ranges including the Olympic, Columbia, Rocky Coast and Cascade Range. Some of these mountains form what is known as a “rain shadow”. This decreases the amount of rainfall on the leeside of the mountain creating a protected cruising ground with steady wind conditions and calmer waters, making it a very favourable yacht charter destination. The cruising ground can be split into four distinct sections, the San Juan Islands, Canadian Gulf Islands, Sunshine Coast and Desolation sound. The various archipelagos have over 700 islands and reefs, miles of sheltered waterways and numerous secluded anchorages giving yacht charterers of all levels a rich variety and exciting sailing area to discover. Whether you choose a motor yacht or a sailing yacht you will be equally pleased with what the Pacific Northwest has to offer. Sailing in the sunny Pacific Northwest you will be surrounded by a stunning dramatic coastline, picturesque sheltered coves, beautiful sandy waterfronts and a spectacular amount of wildlife and marine life. As you sail your yacht amongst these calm waters you will be amazed by the spectacular display of dolphins, seals, sea lions and river otters. The rugged unspoiled coastal scenery is a nature loves paradise and the blue sky is filled with Ospreys, Bald Eagles, Hawks and migrating birds such as the Canadian Geese, Oystercatchers, Trumpeter Swans and you will often see the brightly coloured Great Blue Heron wading in the shallows. 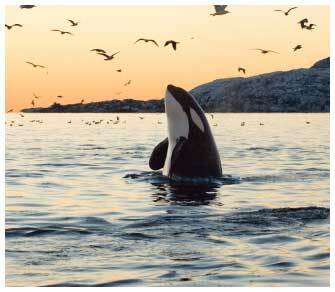 During the summer months, between April and September, the main attraction around these gorgeous islands is the fascinating Orcas (killer whales). There are around 100 resident Killer whales and an even larger number of transient whales all following the salmon run, there is no better place on the west coast to see these remarkable massive marine mammals. The waters are internationally recognized as a premiere diving and snorkeling destination, so swimming in the warm water amongst the amazing reef formations and brightly coloured marine life makes for a pleasant afternoon. The short passages from port to port will have you captivated by the sheer beauty of the snow capped mountains, cascading waterfalls that tumble over rugged cliffs and the steep sided majestic fjords. Many of the islands are situated in the marine parks and not only boast beautiful shorelines but have sunny meadows, lush green forests and rolling countryside. Each island has its own unique history with distinctive charm and rustic villages and towns. Once you have dropped your anchor in a half hidden inlet or historic harbor, dinghy into shore and sample some of the mouthwatering cuisine in one of the traditional waterside restaurants. Specialties are mainly seafood and include oysters, clams, prawns, salmon and cod. The local bars are a great place to relax and have a beer before taking a leisurely stroll along the docks or shopping at the local weekly markets that sell everything from local dairy produce, to New Age jewellery, crystals and home-smoked salmon, sold by the slice. Explore the islands with their many historic museums, craft markets and art galleries that are full of an exceptional array of unique styles in paintings, sculptures, pottery and many other interesting works of art. Yacht charterers will find numerous fully serviced modern marinas on the islands and you will always be able to find provisions, ice, water and fuel. 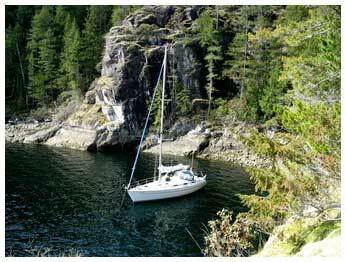 Pacific Northwest Charters starting in bellingham, comox or sidney offer fabulous cruising grounds along the Canadian west coast, Vancouver Island, Desolation Sound and Howe Sound. Whether Gulf Island sailing on adventure vacations or cruising the San Juan Islands spotting orcas you are guaranteed an amazing sailing holiday. A varierty of monohull, catamaran, powerboat and luxury yachts whether bareboat, skippered or fully crewed provide numerous options for your sailing vacation in washington state or british columbia. The Pacific Northwest Cruising ground is a perfect place for the outdoor enthusiast and you will never be short of things to do. Not only does it boast fabulous sailing conditions and protected waters, but offers picturesque hiking trails, nature watching, breathtaking scenery and great culture and history. Once you have sailed in these outstanding waters you will definitely charter a yacht here again.